Christen Stovall is the author of the Song of Souls trilogy. She’s also a regular host on the YouTube pop culture series Breaking the 4th Wall. She lives in Kansas in the home she shared with her late husband, Dustin, and their two dogs, Cora and Sophie. She first discovered a love of storytelling on the stage. In her late teens she began writing, a hobby that helped her through her husband’s death. Let me start by saying I love Star Wars: The Old Republic. I’m not even going to try to calculate the hours and money I’ve invested in this game. Suffice it to say, the numbers are high. That fact makes this article even more difficult to write. I’ve never been one to rail at the development team, or the “devs,” as they call themselves. I’m not a game designer and I have no idea how to put an MMO together. Like many other subscribers, I occasionally complain on the forums about wanting my old companions back or a bug that disrupts playing, but I’m a pretty happy player otherwise. However, the most recent addition to the game, Crisis on Umbara, is coming dangerously close to crossing a line for me. If you haven’t reached this point in the story stop reading now because major spoilers are about to be dropped, particularly for Crisis on Umbara. Last chance to avoid spoilers for the base game, the expansions, and Crisis on Umbara. Still with me? Your choice. In the Iokath expansion, we learn that there’s a traitor in our ranks: someone we trust. Oh, how intriguing! Who could the mysterious traitor be? This could have been an interesting twist in the story, one that helped the player return to the basic Republic vs Empire gameplay we started with. Unfortunately, once one runs the Crisis on Umbara flashpoint, it becomes little more than a slap in the face to the female and gay male player base. The traitor is Theron Shan. 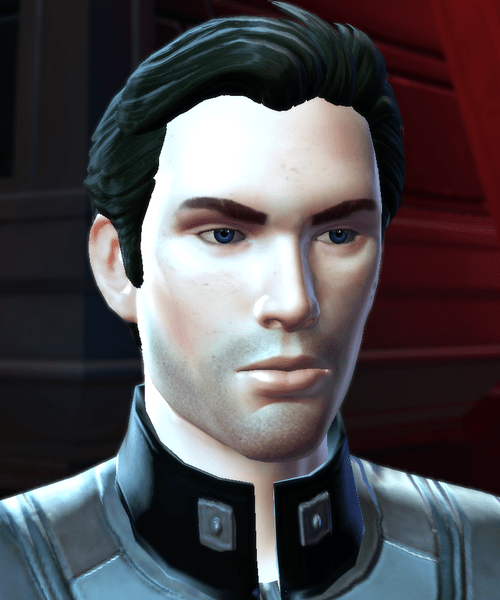 Theron is easily one of the most popular love interests for female players, and one of the few that can be romanced by men as well. Since I’m neither male nor gay, I’ll be focusing on the straight female perspective. Now, before you assume that I’m just whining because they took my love interest, you should know that I have never actually romanced Theron. I enjoy running with him as a companion but I prefer Vector Hyllus over pretty much every NPC ever. The reason Theron’s reveal as the traitor bothers me so much is that it’s not the first time a male love interest has betrayed and tried to kill the female player’s character. I see a pattern here and I find it extremely disturbing. In the Sith Warrior story, the love interest for the female player is named Malavai Quinn. Romanced or not, Malavai spends the first half of his time with you watching your character and plotting. It culminates in a failed murder attempt. There is no question that he knowingly and willingly attempts to kill you. However, he’s the only love interest available for the female Warrior and you can choose to forgive him and continue the romance. No matter what, he remains part of your crew. Still, Quinn remains a popular love interest among many female players. I don’t personally understand it but to each their own. Additionally, Koth, another romance-able male character in the expansions, also has a scenario in which he betrays, or at least leaves, the player. I haven’t personally played it, but it’s something that only triggers as a result of choices the player makes throughout the course of the expansion. Since his turn is a result of numerous player choices, it’s different and less aggravating to me than the unavoidable betrayals of Quinn and Theron. The problem isn’t that they betray you – good storytelling often includes twists like that. The problem is that it’s locked into the story and that there is not a single instance in the game where a female love interest betrays the male player. One can argue that Kira Carson has a moment where she appears to turn on the Jedi Knight, but she’s being controlled by the Sith Emperor. It’s not a true betrayal because it isn’t a willing choice. I’m talking about romance-able characters making a conscious decision to harm the player’s character. So far, this only happens with the male characters and that’s not okay. There are a couple of messages this sends to straight women and none of them are healthy. The first, and potentially more damaging, is that it normalizes this kind of abuse and betrayal from a partner. Young girls getting ready to step into the dating world play this game. What does this sort of thing teach them? It shows an attitude of acceptance toward a man attempting to harm a woman. As someone who has a friend whose marriage ended because her husband attempted to murder her, I find that utterly appalling. The second message that one can derive from all of this is that the female player simply doesn’t matter. It doesn’t matter that she has put forth time and effort to win that companion over. It doesn’t matter that she enjoys the romance written into the story. That’s all disposable for the sake of the writing team’s slipshod vision. The traitor could have just as easily been Lana Beniko, the female love interest. Or it could have been either Theron or Lana, based on the player’s choices. Nope, it was just Theron because it’s okay to take companions away from the female players; they aren’t as important. Except that we are. Our subscription fees are the same price and are paid with the same currency as the male players. We invest just as much time and effort into building our characters as men do. I’ve played the flashpoint several times now and I support the theory that Theron’s acting as a triple agent and actually trying to save the Commander and the Alliance. I really hope that’s the case. 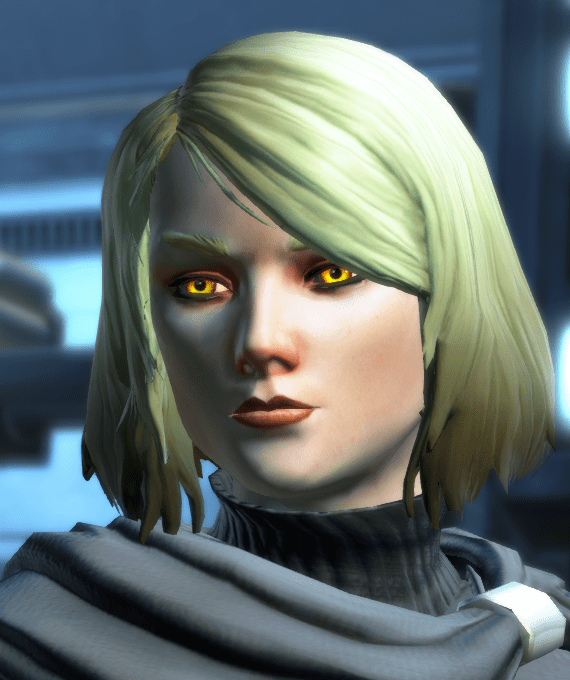 I’m willing to say that the triple agent idea would negate the toxic tones for a non-romanced Theron. However, If the player romanced him and he’s doing this without letting her/him know then that’s still a huge violation of trust. The toxicity of the message remains and the sad thing is that SWTOR has one of the larger female player bases in the sci-fi MMO genre. I’m going to give the writers the benefit of the doubt and believe that they just didn’t think about the implications of all of this. That doesn’t make it okay, but I try not to assume the worst about anyone. I’ll stick with it and see where the story goes for now. I like this video game and I want to keep playing it but this pattern needs to be broken. I hope that they can find a way to fix this and present a positive message in future installments. The Huttball is in your court, Bioware/EA. All character images are from Star Wars Wikia. This pattern extends to other BioWare games as well — most notably the Dragon Age games. They’re amazing feats of storytelling and adventuring (and I definitely recommend them to anyone and everyone because I think they’re even better than SWTOR), but the amount of times I got roped into situations where the male love interest completely betrayed my character and there was absolutely nothing I could have done to avoid it is STAGGERING. It’s to the point where when they started talking about a traitor, I was 100000% sure it was going to be Theron, because THAT IS WHAT BIOWARE DOES. Somehow they think these are clever plot twists when in fact it’s just the same old pattern being rehashed over and over — which is not only poor writing, but also, as you’ve illustrated here, sends destructive messages to their female gamer base. Morrigan for straight men. And Anders and Theron for gay men. It’s not just straight women that get betrayed by their male lovers. What is even worse is that the devs tried to fix this mess and have Theron beg for forgiveness then pop the question to the player character. Now we just get back from Nathema with a half dead Theron who makes a miraculous recovery in a matter of what – hours? and asks to marry the character. Now in reality, I think most women would have tossed him to the curb but this is a game and probably the ONLY opportunity we would ever have of a marriage proposal from him. Ill-timed? Yes. But something many couldn’t pass up given the way the game plays out.